Der Text ist in gekürzter Form von Suneera Kasliwal, Classical Musical Instruments, Delhi 2001, entnommen. The most widely-known and used free-reed aerophone in India is the harmonium and have been imported from the West. No foreign instrument, however, has caused such a commotion as the harmonium and none is used so extensively, be it in classical, light, film or folk music. It is probably the most commonly used instrument in northern India. The harmonium was brought to India either by Western traders or by religious missionaries and musicians in the late nineteenth century. Most probably it was first introduced to Indian music in Calcutta, and from there it spread all over the country. In India today, harmonium finds a place in music of all kinds, whether it is folk, light, semiclassical or even highly-reputed classical music. 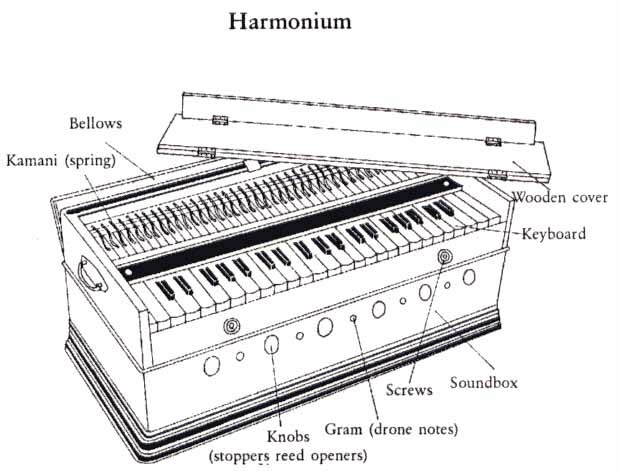 The Indian harmonium is not the heavy and big pedal instrument of Europe, but has been reduced to a small portable box, which is approximately two feet by one foot and about nine to ten inches high, the back of which opens to act as the bellows. On the top is a keyboard like that of a piano, but with a much smaller range, usually of about three octaves. This is played by one hand, while the other works the bellows. It consists of a set of free reeds, whose length determines their pitch, activated by a wind supply from hand-operated compression bellows and controlled by a keyboard. The reed is responsible for the tone and pitch, whereas the air bellows, with all its attached valvular mechanisms, produce and control the passing air, and are responsible for the volume of the instrument. The reeds, one for each note, are fixed at one end and are kept free at the other. When the bellows are compressed, the air passes under the reed vibrating it, thus producing the desired pitch. However, the whole process is controlled by a keyboard that makes it a very simple and hassle-free instrument. The harmonium is a keyboard instrument on which twelve semitones of the tempered scale are fixed once and for all in all the three octaves: mandra, madhya and tara. On keyboard instruments only straight notes can be played, grace notes and quarter-tones not being possible. There is no possibility of a slur, meend, or gamaka being played on the harmonium, which are the main essence of Hindustani music, and are essential to keep up the spirit of Hindustani ragadari system. However, it is possible to maintain the continuity of the music to some extent by a skilful handling of the bellows and finger pressure on the keys, but it cannot compete with the continuity of the human voice or the sarangi's sound. Although roughly the Indian scale of music of twelve semitones is nearly the same as that in Western music, there are certain vital and perceptible differences between the two. The Indian concept of swara does not relate it to a specific pitch point, but to a pitch-range with variegated possibilities of shades and nuances. No keyboard instrument can respond to this concept of swara. For these reasons, the harmonium was banned in music broadcasts over the National network from 1 March 1940. Some purists like Ameer Khan, Bade Ghulam Ali Khan, Begum Akhtar, etc., went on to even favour the harmonium as an accompaniment as against the sarangi, because they found its notes were unsagging and constant. Its uncanny popularity, therefore, led AIR to seriously review the question of its use in broadcasts of classical and light music, and ultimately in October 1970, after an exile of over three decades, AIR had to issue a directive partially removing the ban on the harmonium in the broadcasts of classical and light classical music on the national network. Though the harmonium is not in vogue in the Carnatic music system today. Today's version of the harmonium is capable of providing a whole range of tonal excellence very rare in other instruments. A top quality harmonium has two, three and even four sets of reeds. The instrument covers three to four octaves, encompassing sub-bass, bass, medium and female. The instrument is larger and has built-in gadgets to filter the air through two compartments. The merit of this arrangement is that when the air is blown into it, it does not strike the reeds aggressively. From the airtight compartments the wind emerges softly through the reeds when a key is pressed. In the olden days the instrument was equipped with only a single piece reed board. This made the sound it produced strident and harsh. Present-day harmoniums have three reed boards joined together with the provision for air-release in a zigzag fashion, ensuring softness of tone and melody.